More than 340 households across the Thames Valley have been unable to move home after last summer's floods, with 27 still living in caravans. But the government figures show the number of households that have not been able to go home has halved in the past two months, down from 684. Fifteen households living in caravans have also returned home, down from 42. West Berkshire is most affected, with 168 households still not back in their properties, with 12 in caravans. In West Oxfordshire, 90 households are still not home and 10 are in caravans. 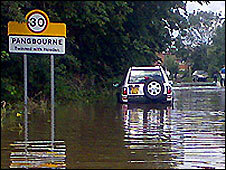 Residents in the Vale of White Horse, Wokingham and Oxford are also affected. A total of 48,000 homes across the UK were affected by last summer's floods, the government said. About 3,400 are still not fully able to live back at home. The areas with the most households still displaced are Hull; East Riding, Yorkshire; and Tewkesbury, Gloucestershire. Floods Recovery Minister John Healey MP said: "The number of flood-hit families still out of their homes, living in temporary accommodation, caravans or the top floor of their homes has fallen by a quarter in the last month and the numbers in caravans have halved. "This shows that thanks to sustained efforts of councils, housing associations, insurers and government, the numbers of those still not back home are falling faster and faster." "This weekend marks one year on from the floods that hit Gloucestershire, Oxfordshire and many other parts of the country. "Over the year so much has been achieved by so many people. "For those still not back in their homes my message is clear - you have not been forgotten and you are not alone." He added he would work with councils and insurers for "as long as it takes" to get people home as quickly as possible.